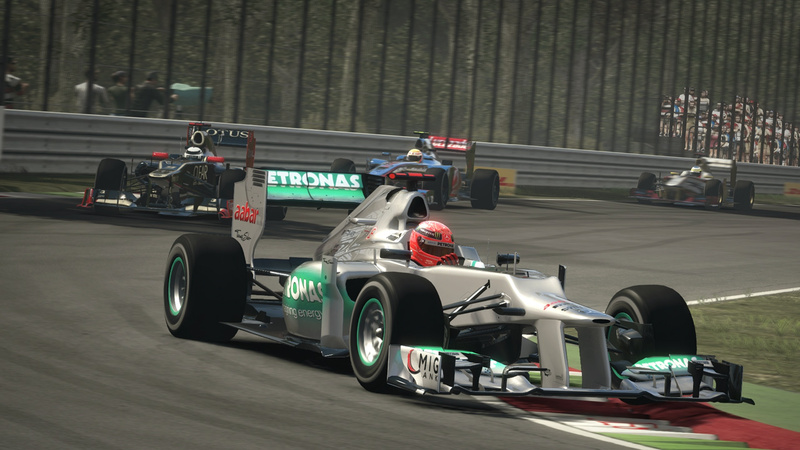 Codemasters still remain as one of the last original British developers. Since the late nineties their field of expertise has shifted away from the action adventure genre to racing simulation. Gradually their acquisition of racing properties has reached as far as the WRC to the BTCC and in 2009 they became the official holders of the Formula 1 licence. 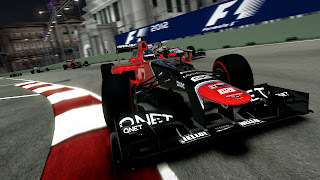 F1 2012 is the latest annual instalment in their simulation series of the world’s most popular racing sport. 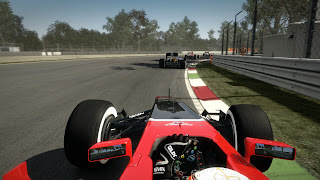 When starting F1 2012 for the first time, players are taken to the Young Drivers Test. This newly added training mode introduces newcomers to all of the skills that will be required in order to compete at a higher level. The pace of the Drivers Test is superbly executed and gradually eases first timers into every technical aspect of professional racing. Though at times this tutorial will seem a little steep in difficulty, it can be wrapped up in about twenty minutes or so. If the lessons are taken seriously then you're saved from much frustration and heart ache later on, as you will be prepared for the more difficult challenges later on. Speaking of challenge, another new entry to the series is Champions Mode. This mission mode gives players a range of unique scenarios with increasingly surmounting odds. Every mission adds a new element which requires an application of strategy and technical know how in order to succeed. The missions are unlocked one by one and while seemingly annoying at first, this lockout feature does a great job of keeping players focused on the task at hand. Like all the other modes in the game, players can still select from an easy, normal or hard difficulty setting. Though even on easy, this mode is vicious to say the least and is guaranteed to test even the most seasoned of racing veterans. But despite the sheer difficulty, the satisfaction of completing these missions is unprecedented making Champions mode one of the greatest aspects of the game. Season Challenge is also another welcomed addition to this version allowing players to take on a shortened down ten race career. The major difference when compared to the standard Grand Prix is that players initially start at the very bottom and can only side with a low ranked manufacturer. Only by beating a chosen rival in each race can the player steal their existing role into a new team granting them access to even greater engines. The added rivalries and the progression by devious head hunting certainly provide for a far more enjoyable experience than a simple Grand Prix. But no there’s no need to despair. Of course the old staples of the Grand Prix and Time Trial modes from the previous instalments are still present in all of their previous glory, allowing players to customise the experience to suit their needs. Also the competitive and co-operative online features make a return and are just as agreeable as they have been in the past. 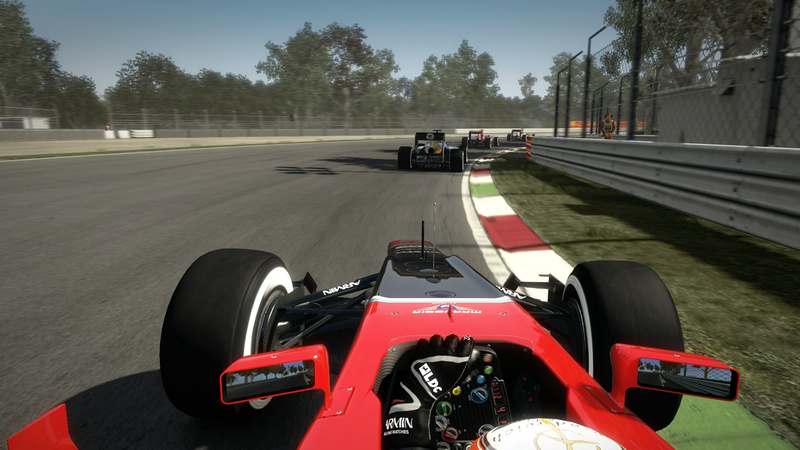 F1 2012 is complimented by some modest yet effective presentation. Pre-race the game is streamlined with a much needed redesigned main menu which was in dire need of fixing since the previous game’s mess of an interface. During the races themselves, F1 2012 is simply stunning, though ironically a lot of the graphical prowess will go un-noticed to those pre-occupied with actually driving. However the tracks are well detailed and the game is a sheer delight in the graphical department. The use of lighting and shadow are the most striking aspects of the visuals by far. Even the weather effects have been improved to a great degree. Wet and rainy weather conditions are the most notable as they do a great job of showing a dynamic change in the tracks conditions. This emphasised sense of immersion helps to further convince players to return to the pit for a change of tires. A far more effective method compared to simply relying on the game to tell the player to do so. Human character models in the game are somewhat garish at times but considering that most of the game’s graphical showing takes place on the track it is an oddity that is rarely noticed and will unlikely ruin any enjoyment. The cars themselves however are modelled accurately down to the very last detail adding an even greater authenticity to the overall experience. The voice work is suitable for the genre and the vocal direction is expertly handled throughout the course of the game. It is consistently clear and concise without any unnecessary repetition. The race engineer does a fantastic job of keeping the player up to date at all times. This consistency allows the player to concentrate on the track while the race engineer dispenses sound advice on the weather, car condition and the current situation of the race. Engine revs and tire screeches are just as accurate and nothing feels out of place, this focused consistency with even the most insignificant of details demonstrates the developer’s commitment to keeping the simulation accurate at all times. There is no doubt that by their very nature, simulation games are always un-forgiving to those who hold no knowledge of task being recreated. After all fans of the subject manner will usually hold more knowledge of the ins and outs of the topic, leaving newcomers bewildered and in some cases put off all together. The previous titles in the Codemasters F1 series were flawed for their unwillingness to accommodate for new players. Luckily, F1 2012 has taken great strides in order to prevent this mistake from ever happening again. In addition to the previously aforementioned Young Drivers Test, F1 2012 also adds a plethora of ways to not only welcome newcomers but also keep them interested in the game. Every aspect of the games difficulty and controls can be tweaked and micro managed to give the player as much assistance or as much challenge as they require. The player has access to an automatic or manual gearbox and even then, automatic controls can be overridden at any time if the driver wishes to do so. Race lines can be easily toggled on and off giving an extra level of insight to those un-initiated. Even the brakes can automatically kick in of their own accord to reduce the speed of the car when approaching a corner. Though undoubtedly this feature will disgust purists of the genre it allows players regardless of their skill level to enjoy the game without spinning violently off the track at every corner. Though make no mistake here, the game is consistently difficult, sometimes brutal. However the player will rarely ever feel the sense that the challenge is un-fair and the reward from taking the time to practice and improve their performance leaves an incredible feeling of self satisfaction. The game also makes an extended use of the KERS and DRS that was implemented into its recent predecessor. KERS or the (Kenetic Engine Recovery System) is a seven second boost of horsepower to rear wheels which is effective for boosting from a start and for both overtaking and defending from being overtaken. While DRS or (Drag Recovery System) is the control of the rear wing which can help to reduce drag on the car but can only be used under very strict conditions. At lower levels, players will barely need to use these additions at all but in the harder difficulty sets and Champions Mode, greater application of these speed boosting devices are crucial to guarantee first place. The rewind feature from the DIRT series is also put to good use here as well. These limited uses of being able to retake small portions of the race are a real life saver and can save the player from much unwanted frustration. Like the majority of the games features and controls these can simply be turned on or off with ease. Speaking of controls, even on a standard game pad the ability to control your vehicle is incredibly tight and while a smooth application of the steering and pedals is required at all times the control scheme will rarely ever let a player down. One minor frustration does arrive from the interface design of the car’s cockpit. Depending on the viewpoint of the driver some the more important information such as the state of the KERS and DRS is far too obscured. The game tries to make up for this visual handicap by awarding the player with a “Realism” achievement but this is a poor reconciliation for potentially crippling the player’s performance in a game that is already hard enough. 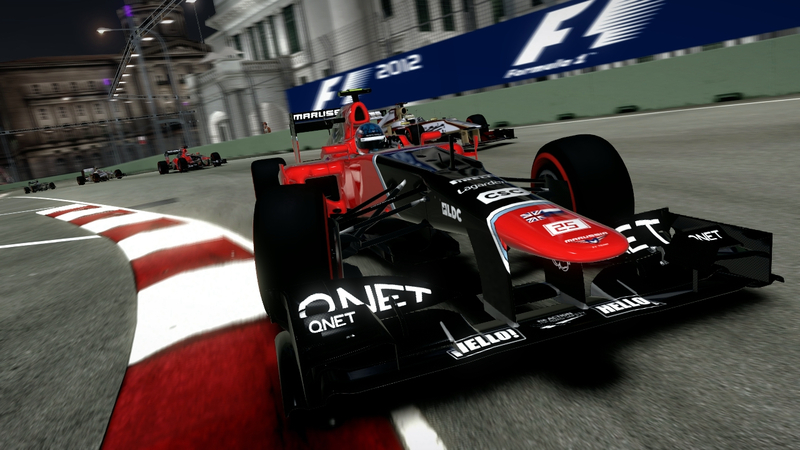 F1 2012 is a very commendable effort. 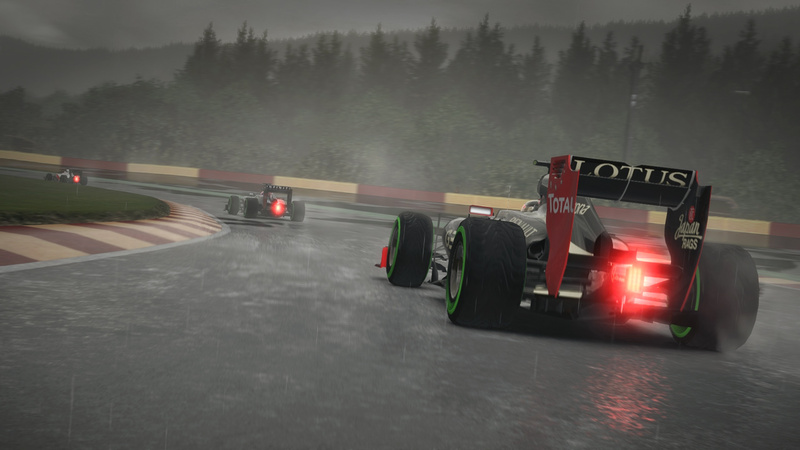 This time Codemasters has managed to keep what made the previous titles enjoyable while going to great lengths to cater for new players. The game is multifaceted and will offer a tailored experience to anyone from arcade racers to a seasoned fan of the sport. The most impressive thing about this flexibility is that it is able to please all crowds without being alienating or ruining any possibility of enjoyment. Overall F1 2012 is a strong recommendation to any Formula 1 fan or those who are curious enough to delve into the racing simulation genre.